On 12 February 2006, the recurrent nova RS Ophiuchi erupted for the first time since 1985, its 6th (at least!) known eruption. This event triggered an intensive multi-wavelength observational campaign, from the radio to gamma-rays, and theoreticians have been presented with a wealth of high-quality data. 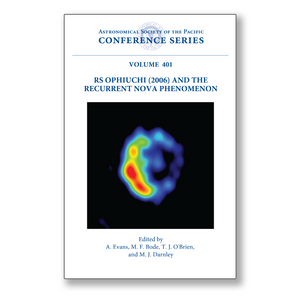 A workshop was held at Keele University, UK, from 12-14 June 2007 to discuss the observations, their interpretation, and where RS Ophiuchi sits in the wider astrophysical picture. The workshop brought together observers, from gamma-ray to radio wavelengths, theoreticians, and workers in closely related areas. The workshop considered not only the 2006 eruption of RS Oph but also the implications that this has had for our understanding of other much broader areas of astrophysics. It was wide ranging, taking in the environments of red giants; supernova progenitors; accretion, thermonuclear processes and evolution of close binary systems; and shocks of jets, as well as recurrent novae and related objects. The proceedings contain 15 invited reviews, 38 contributed talks and posters, and 3 specially commissioned papers which we hope will enhance the value of the workshop for the wider astrophysical community.